As the New Horizons spacecraft gets closer and closer to Pluto in advance of its July 2015 flyby, it manages to and gathers more and more information. As a result, we learning more about the dwarf planet on an almost regular basis. Pluto is now becoming more to the public than just the planet that no longer was; before long, we’ll be able to understand much about its atmosphere, its moons and how it fits into the story of the Solar System’s history. 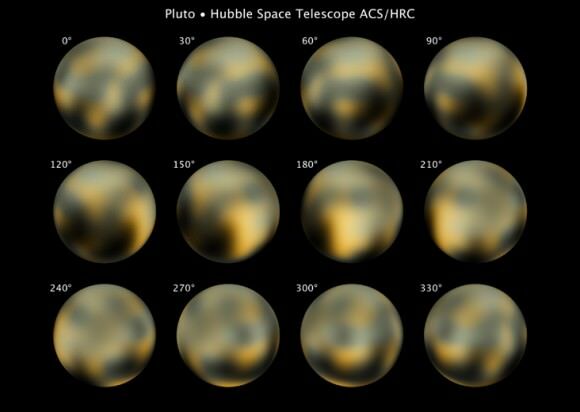 Here are some of the most interesting things we know about Pluto so far. Back in 2006, the International Astronomical Union deemed Pluto is a dwarf planet and not a planet. The reasoning came after a few other objects were discovered far out in the Solar System that are close to Pluto’s size. That said, the principal investigator for New Horizons, Alan Stern, does not agree with the definition. At the time of the vote, he pointed out that the IAC’s definition of planet was not completely true of any larger body; for example, Earth does not clear the entire neighborhood of debris, which is one of the parts of the definition. For decades, astronomers knew of Pluto and its moon, Charon. The two are so close in size that some people considered the system a double planet, but now that’s thrown in doubt with the dwarf planet designation. In any case, in the last decade humanity has discovered several more moons as telescope resolution and observing techniques improved. The other moons are called Nix, Hydra, Kerberos and Styx. For now we don’t know much about these smaller moons because it’s so difficult to resolve features on their tiny size. It seems unbelieveable that Charon could have an ocean given it’s so far away from the Sun, but at least one study suggests that it could be possible. Essentially, the tidal force imparted by Pluto’s gravity early in Charon’s history could have stretched the moon’s insides and warmed them up enough to create liquid. That said, it’s also possible that the ocean is now frozen as Charon’s orbit is not as eccentric as it was in the past. As with our own Moon, some scientists believe Charon was created after a large object smashed into Pluto billions of years ago. This would have created a chain of debris circling the dwarf planet, which eventually coalesced into Charon. However, the other moons we know of near Pluto have almost exact resonances with Charon. This suggests that they also formed from the debris, one study says. Pluto is a tiny world, but like the Moon and Mercury it does have a very tenuous atmosphere that is called an “exosphere.” Astronomers first spotted signs of it in 1985. 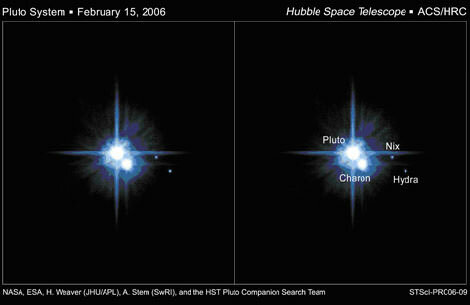 As Pluto passed in front of a star, they saw the star very slightly dim before Pluto completely blocked the star. The composition of this atmosphere is mostly made up of nitrogen and methane, and it freezes when Pluto is furthest from the Sun. We used to think of Pluto as the furthest planet from the Sun, but in reality its orbit is so eccentric that it comes closer to the Sun than Neptune. According to NASA, its average distance from the Sun is 39.5 astronomical units (Earth-Sun distances), but it can come as close as 29.7 AU and as far away as 49.7 AU. It was last “inside” Neptune’s orbit between 1979 and 1999. Let’s be clear that Triton and Pluto have very different histories; for example, Triton was likely captured by Neptune long ago, an event that drastically altered its surface and its insides. But Pluto and Triton likely do have some similarities: the frozen volatiles (elements with low boiling points), the faint nitrogen atmospheres, and their similar composition of ice and rock. Scientists are pulling out old Voyager 2 pictures to make the comparisons as Pluto pictures arrive from New Horizons. It’s not a guarantee, but at least one research team suggests that debris floating around Pluto could coalesce into a faint ring system. This wouldn’t be a large surprise, by the by, as we already know of at least one asteroid that has rings — so it is possible. Researchers on New Horizons will also be on the lookout for more moons and interesting features on Pluto’s surface such as cracks. We have many interesting articles on Pluto here at Universe Today. For example, here’s Is There Life on Pluto?, Why Pluto is No Longer a Planet? and How Long Does it Takes to Get to Pluto? And for more information on the New Horizons mission, check out our articles, New Horizons Exits Safe Mode and Pluto’s Time to Shine Just Hours Away. And be sure to check out NASA’s New Horizons mission homepage. my teacher told us that planet Pluto is no more, it has burst, is that true or false? Yo Jeffrey, I had posted that comment on May 23, 2011 (the article is an update of the earlier one), but thanks anyway! Pluto was discovered less than 100 years ago. Its discoverer, Clyde Tombaugh, lived to see early plans for a space probe to visit it. First, a huge thank you for starting this article by noting that Pluto’s classification as a dwarf planet remains controversial. Too many writers act as though the decision by four percent of the IAU is a done deal as opposed to one position in an ongoing debate. Interestingly, there is also controversy about whether dwarf planets should be considered a subclass of planets. The 424 IAU members who voted in 2006 specifically stated that dwarf planets are not planets, yet Dr. Stern, the person who first coined the term, intended it to refer to a third class of planets in addition to terrestrials and jovians, small planets large enough to be rounded by their own gravity but not large enough to gravitationally dominate their orbits. Establishing dwarf planets as a subclass of planets would be consistent with other uses of the term “dwarf” in astronomy, as dwarf stars are still considered stars, and dwarf galaxies are still considered galaxies. Pluto may also have a subsurface ocean. There is even a remote chance that if they exist, subsurface oceans on both Pluto and Charon could host microbial life. Pluto and Charon may also share an atmosphere. Significantly, Pluto and Charon are the only true binary planet system in our solar system, as both objects orbit a barycenter outside of Pluto itself. I always wondered if it’s possible for Charon to have a tiny moon of its own. It always struck me as strange that none of the big satellites of the Solar System, Ganymede, Titan, Callisto and others, have little moonlets. the Definitions of planets might probably be better defined by impact velocity vs orbital velocity vs escape velocity vs local escape velocity Sun. If its unbalanced its Asteroid or Comet. ofc, if it start to glow, its probably a misplaced lightbulb. Mewo: satellites of satellites are unstable and crash in fairly short periods of time. Our Moon may have had several in its early history, but they would have fallen early on. The subsatellites left in orbit by the last three Apollo missions lasted only months, and more recent missions have all had short lifetimes. I read an article years ago by Isaac Asimov in which he said this was why Mercury and Venus had no moons, but I’m not sure if that was calculated or just an assumption. Best, DL.